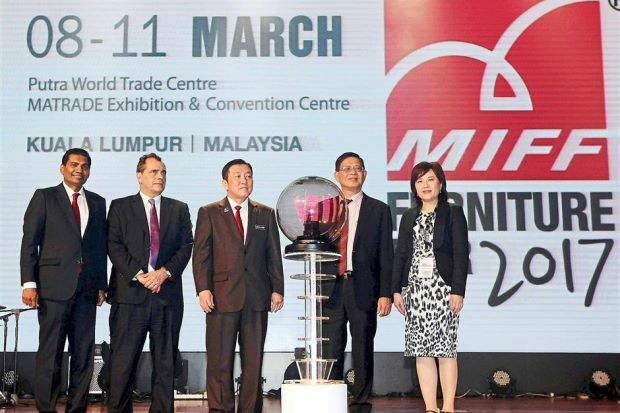 The Malaysian International Furniture Fair (MIFF) goes into its 23rd edition next March 2017 with resounding support from returning and new exhibitors taking the opportunity to set up a stronger presence when the show expands in 2018. MIFF 2017 organised by UBM Malaysia is scheduled from Mar 8-11 at Putra World Trade Centre (PWTC) and Matrade Exhibition and Convention Centre (MECC). In 2018, the show is set to grow 25% bigger to 100,000 sqm at the brand new Malaysia International Trade and Exhibition Centre (MITEC) and PWTC. Exhibitors in 2017 will enjoy exclusive privileges to showcase at MITEC in 2018. Buoyed by the strong buying mood of more overseas and new buyers at MIFF 2016 driving record sales of US$908 million, the 2017 edition is witnessing again a high return rate of exhibitors. “Based on the pace of rebookings and feedback, MIFF 2017 marks a vigorous push by exhibitors to widen their network of buyers and showcase their products because many of them want bigger exhibition space in 2018,” said Ms Karen Goi, MIFF General Manager. An annual sell-out with 500 international companies from over 12 countries and thousands of new products, MIFF remains a benchmark in global furniture trade, drawing 20,000 visitors from as many as 140 countries and regions. It now has the added boost of an online trading platform with Alibaba.com that debuted last year. The diverse international presence, including one in four buyers coming from a neighbouring ASEAN country, bolsters MIFF’s position as the ideal gateway to capture business opportunities in Southeast Asia and other emerging markets such as South Asia, Middle East, Africa and East Europe. Importers, exporters and wholesalers make up over half of trade visitors to MIFF, a show renowned among international buyers for quality, value and wide selection of all types of furniture including the much sought Malaysian wood dining sets, bedroom and dressing furniture. Besides home furniture, MIFF is the only trade show in Southeast Asia featuring an extensive and the biggest collection of modern workspace solutions in the region. In line with this, a designated area named MIFF Office is created in 2017 to showcase an expected 130 companies including from Malaysia, Taiwan, China, South Korea and Indonesia, displaying executive office chairs, desks, workstations, conference/meeting room furniture, reception area furniture, partitions and storage. “We are constantly looking for ways to benefit our customers. The global demand for office furniture is picking up again and the work place and work culture are also changing. With a designated area, MIFF Office will help generate more leads for exhibitors and for buyers to better access innovative products and suppliers. In short, they will have a more streamlined sourcing and productive experience at MIFF,” added Ms Goi. Visitor registration is open now on www.miff.com.my. Those who pre-register will receive free admission to all four days of the show, access to International Buyers Lounge, ticket to Buyers Night and a host of other benefits. For more information about MIFF 2017 and free subscription to the MIFF enewsletter to keep updated, click on www.miff.com.my.